Inventory We are a resale marketplace, not a box office or venue. Ticket prices may exceed face value. This site is not owned by The Met Philadelphia . The Metropolitan Opera House in Philadelphia, PA. Steeped with history offering concerts, theatrical shows, opera, and musicals the Opera House will be a reawakened giant in entertainment for Philadelphia. Built in 1908 by Oscar Hammerstein and stayed true to its mission until 1934. Then the Opera House spent 50 years showing movies until its sputtering existence as a ballroom, sports venue, and a church. In 2017 the Philadelphia Opera House underwent a 456 million dollar renovation. Now with all of the modern bells and whistles as well as the classic styling you have a blended experience that few other venues could ever hope to offer. December of 2018 Bob Dylan will be the re-opening act and many more top tier will occur into 23019 and beyond. We are not the official website for the The Met Philadelphia nor do we make any claim to be an agent of theirs. 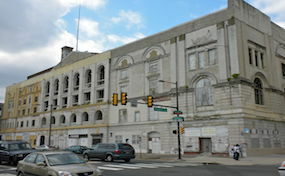 OperaHousePhiladelphia.com is not a primary vendor, supplier, or affiliated with any official website. We proudly provide access to a large supply and low prices online for all secondary market events. Ticket prices may be well below or above face value and will fluctuate with the market. To purchase tickets for all The Met Philadelphia Events simply click on the show of interest or call our operators at anytime.